Santa doesn't leave his shopping til the last minute. When you think about Santa Claus, what comes to mind? A jolly, stout man with a white beard and mustache wearing a red suit who distributes gifts to children around the world every year? Do you picture Santa flying about in a sleigh, drawn by flying reindeer? These are the most common modern images. However, the Santa Claus we know today is very different from history's Santa. So who is Santa Claus? During the 4th century in Mayra (known today as Turkey), there were writings about a Saint Nicolas, a bishop who cared for the poor and was said to be a patron saint of children. During his lifetime, it was said he helped people survive a famine, fought for civil justice, saved the lives of three condemned men, and taught the Christian gospel in a way that was understood by the simplest person. His existence as a real person has been questioned, but certain documentation has left the door open to keep Saint Nicolas's existence from being simply a folklore legend. Even after Saint Nicolas's time, the caring, faithful and compassionate nature of this man was remembered through history. When the Europeans came to the New World, cathedrals were dedicated to him, and people would leave fruit, nuts and sweet treats on their windowsills and fireplaces as a tribute to his giving nature. During the 1600's, the Puritans forbade the celebration of Saint Nicolas. However his existence did not become erased from memory or in the hearts of people. By 1804, the image of Saint Nicolas had changed. A writer named Washington Irving created the image of him as a patron saint of the city, and drew images of him as an elvish character with a pipe. Saint Nicolas Day was celebrated, and the idea of him bringing gifts of toys for children down the chimney was born. Then in 1823, the famous poem "The Night Before Christmas" was written by Clement Clark Moore. Influenced by Irving's writings, he began to create the new Americanized version of Saint Nicolas. In 1863, Saint Nicolas became known as Santa Claus, a name created from a combination of the Dutch name Sinterklaas and the German name Sankt Niklaus. In the 1920's he started being pictured as a stout, jolly non-elvish character who wore a red suit with white fur trim and had white hair with a flowing beard and mustache. For transportation, he had a sleigh driven by flying reindeer so he could deliver presents worldwide. Then in the 1930's, the image of Santa Claus started being used in commercial advertising for Coca Cola. 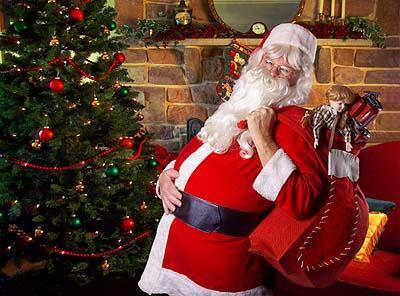 By the 1950's, the Santa Claus image was being used to endorse numerous products. The image of the saintly bishop had disappeared, leaving a tradition of consumer spending and gift giving. Today, he is still being represented as a generous gift-giving soul, one who travels by sleigh with flying reindeer to give presents to good children. Despite the commercialization of Santa Claus, many people are interested in bringing back the true spirit of Saint Nicolas: the celebration of the birth of Jesus. Of course, many children enjoy the spirit of Christmas by writing to Santa and enclosing their lists. Other services allow children to get personalized letters from Santa which can help add to the magic of the season.